Here at the Schott Foundation, we believe the people most impacted and with the most at stake should be at the forefront of social change. We work to amplify local voices and encourage community leaders to speak out on critical issues, providing tailored support and trainings to strengthen efforts for change across the country. Schott is excited to highlight four of our vibrant community partners on this year’s Giving Tuesday, an annual event that spotlights nonprofit organizations working to make a difference in their communities. Our partners are proof that when communities come together and organize, they can achieve anything—no matter where they are. Your generous donation will support Schott’s ability to provide funding to these dynamic grassroots organizations on the front lines of the fight for education justice, as well as the network-building, policy advocacy and communications resources they need to lead the movement for social change. 100 percent of all donations will go to these four partners. We invite you to get to know these grassroots organizations and make your donation today! RCA members believe change happens through informed and organized residents defining the change they want, building collective power and taking action to improve their lives. RCA staff supports community members with information, resources and training with a special focus on underserved communities in rural Arkansas. RCA believes strongly in the power of youth voice and youth involvement and the organization’s Youth Advisory Board includes youth members from each of RCA’s regions who steer the work and activities of RCA’s larger Youth Network. RCA’s new “I Choose Public Schools Campaign” is geared toward deeper organizing in each of RCA’s regions to promote and uplift public education across the state and to mobilize members leading up to the 2019 legislative session. Journey for Justice (J4J) is an alliance of grassroots community, youth, and parent-led organizations in 25 cities across the country and 5 provinces in South Africa, intentionally carving a space for organized low-income and working-class communities who are directly impacted by top-down corporate education interventions. J4J’s member organizations are built and led primarily by parents and youth of color fighting unapologetically for community-driven school improvement that allows them to be genuine and in the forefront. In four years, J4J has won significant victories in the fight for education justice and works in partnership with true allies who share their vision and commitment to leadership. J4J’s national #WeChoose coalition was formed to battle new Education Secretary Betsy DeVos’ draconian cuts in federal aid to education. The coalition has held “Critical Conversations” across the country, taking on a wide range of issues plaguing city schools and making their demands clear, including a moratorium on school privatization, federal funding for 10,000 sustainable community schools, and an end to zero-tolerance policies in public education. 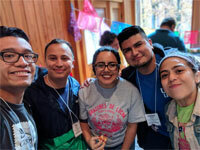 The Arkansas United Community Coalition (AUCC) began working as an immigrants’ rights nonprofit organization with the mission to empower Arkansas immigrants and their communities through organizing, leadership development, immigrant advocacy, promoting civic engagement, and navigating immigration services. Today, AUCC boasts a network of over 150 immigrant organizers and more than 500 active members in 17 communities across Arkansas. AUCC currently maintains seven regional immigrant resource centers, with partners in the communities of Springdale, Fort Smith, Little Rock, DeQueen, McGehee, Monticello and Jonesboro. AUCC envisions an Arkansas that is elevated to its full civic, economic and social potential through the development of inclusive and equitable communities where all multi-ethnic groups, newcomers and native-born Arkansans work together to enhance their collective quality of life. 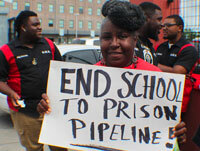 FFLIC is a statewide, membership-based, intergenerational organization committed to abolishing the school-to-prison pipeline and reforming the juvenile justice system. The mission, as established by the families of such children who continue to lead FFLIC, is to end mass incarceration and pursue the reinvestment of society’s resources from punishment to alternatives that promote wellbeing. FFLIC works with populations of young people and families most at-risk of discriminatory discipline practices—like Rahsaan Ison, a youth member who started working with FFLIC at the age of 15 after he was suspended for crossing the railroad tracks in front of his former school, a charter that continually denied Rashaan an equitable education and attempted to push him out at every chance possible. During his tireless fight to be allowed to return to school, Rahsaan’s mom lost her job and the family became homeless. Despite this struggle, Rahsaan’s education remained a priority—Rahsaan became a youth leader at FFLIC and began forming a youth group in New Orleans organized around the national Dignity in Schools Campaign against school pushouts and harsh discipline policies. Throughout several more years of uphill battles at his Louisiana charter school, Rahsaan eventually graduated—with the support not of his school, but of the network of activists and changemakers who had rallied around him. Giving to the Schott Foundation is an investment in opportunity and justice. For more than 25 years, Schott has worked directly with partners like these to further educational opportunity and justice for young people—regardless of race, gender or socioeconomic status.